V. CSIT World Sports Games 2013. 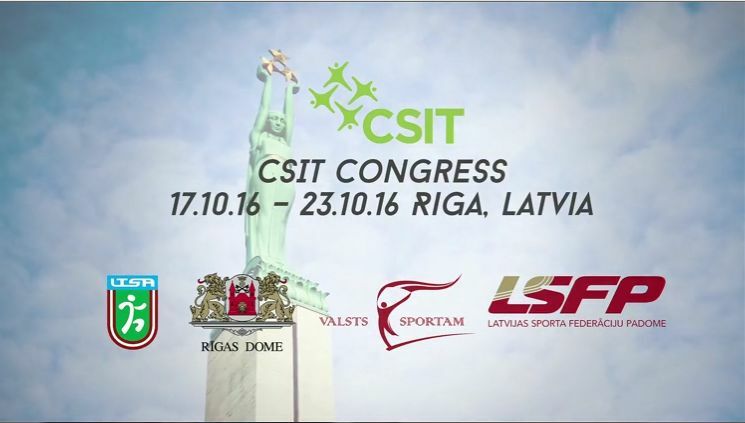 The 5th CSIT World Sports Games has been held from June 13th - 18th, 2017 in Riga / Latvia. #WSG2017: Pics & Videos from our people! Follow us also on Facebook, YouTube and Instagram: "CSIT World Sports Games & Single Championships"! Sport for All & Activities for Elderly People! Paldies Rīgu par brīnišķīgo laiku! Thank You Riga for a wonderful time! Current CSIT President Bruno Molea and former CSIT President Harald Bauer confirmed their commitment for the Green Card as an important item of the CSIT Family on Friday. The Green Card is shown to athletes during competition as a reward for acts of fair play behaviour. “Fair Play is our main value and the Green Card will also lead to more fair play in life style”, Bauer stated on this important sign and opportunity for all athletes. The Green Card has been implemented in close cooperation with EFPM (European Fair Play Movement). Its characteristics are: fair competitions, respect, friendship, team spirit, equal opportunities and fair access, respect for written and unwritten rules such as integrity, solidarity, tolerance, care, excellence and joy. Personally handed over from EFPM board members Katarína Raczova and Baiba Veisa, Varda Mirkin from the Israelian Mamanet team Galili received one of the three Fair Play Awards at the 5th World Sports Games 2017 in Riga. The referee called a ball “out” – Varda called it “in” to her own team’s disadvantage. The second award was given to the Austrian judoka Andreas Mruk, who helped an injured opponent by carrying him out of the gymnasium to let him have professional medical care. The third award was given to the Brazilian table tennis team acceptance of the referees’ verdicts and treating referees with respect. CSIT has implemented the Green Card for special merits in the field of Fair Play. Referees can show this card to athletes who deserve it in their opinion. The cooperation of CSIT and FICS (Fédération Internationale de Chiropratique du Sport/International Federation of Sports Chiropractic) is working great again after the premiere in 2015. 19 chiropracticans from all over Europe are a very important part of the 5th CSIT World Sports Games 2017 in Riga. “Our main work this year has to do with shoulder problems”, says Henrik Hojgaard. The man from Denmark, living in Sweden, worked together with Rainer Wieser from Germany in the Aquatic Center in Kipsala. “But we will change with colleagues who now work at other venues, because it is too humid for us around the swimming pool for four days in a row.” The health workers with their golden hands come from England, Denmark, Sweden, Finland, France and Italy this time. “We need the opportunity to do sports in the same courts at the same time as the regular athletes”, says Anita Pariani. She is representing the FSSP (Federatione Svizzera Sport Paralimpici) and FISDIR (Federazione Italia Sport Paralimpici degli Intellettivo Relanzionale) at the 5th CSIT World Sports Games 2017 in the Latvian capital. “People with all kinds of disabilities want to feel that they are part of the community.” CSIT President Bruno Molea has already put a strong sign to make this integration a future goal for CSIT. Talks with FSSP President Marco Tomasini and FISDIR President Marco Borcacini would be a first step to develop a programme for people with special needs at CSIT events. The Mamanet Movement as official part of WSG has already set an example for integration and inclusion in Riga.